Pioneers in the industry, we offer four sided clock, life time calendar with clock, digital table clock, magnetic cube calendar and spiral calendar from India. Our association is effectively occupied with supplying and trading excellent scope of Four Sided Clock. Our four side tickets are extraordinary brightening pieces in any room with its plan. Moreover, our four side timekeepers give a manly advance on any room that is genuinely attractive. These four side tickets are accessible to our customers at the extremely moderate scope of costs. 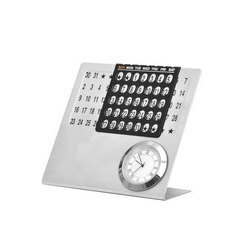 Perpetual Metal Calendar With Clock. Cielo International can develop custom calendar based on brief and even mould new designs. Here are some of the more popular designs. It can be customized with logo printing. Backed by a rich industrial experience, we are engaged in offering a huge array of Digital Table Clock. Utilizing finest grade inputs with progressive tools; these are manufactured with preciseness. More to this, these are methodically reviewed before offering it to our clients. 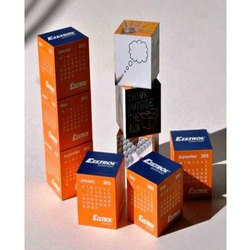 Innovative calendar which has 3 cubes which assemble magnetically to form a tower. It allows users to play assemble rotate create and make the calendar their own. Different visuals combined into one product 100% produced in India.